A recent study by the Pew Research Center reported that one-in-five adults have no religious affiliation. They call this group “Nones” which adds no clarity. Especially since this group includes atheists, agnostics and “nothing in particular.” All three groups are on the rise with the “nothing in particular” garnering the largest increase. 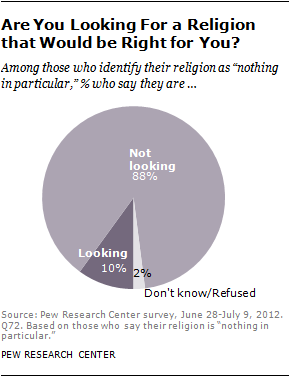 Of that 20% they report on six percent are made of of atheist and agnostics with agnosticism being the larger group. By the news reporting I heard it was made to sound as if the 20% was pretty much made up of atheists. Now obviously we have to NIP (sorry some acronym humor here) in the bud. I find the question interesting since it is so indicative of society. “Are you looking for a religion that would be right for you.” Crouched in terms of relativism instead of in the terms of looking for the truth. I am though rather surprised that of this group of those who choose “nothing in particular” that such a low amount are seeking. Also interesting that Protestant’s of all stripes for the first time are less than 50% of the population. Catholics have held steady, but I would guess that immigration plays a larger part in that than some other factors. I would be interested in a comparison between this study and what is going on in Europe and what factors are different. Certainly the religiously affiliated is higher in the United States than in most countries of Europe. The the unaffiliated is growing and at higher rates among younger people seems to be a cultural indicator that will surprise nobody. I wonder how much of this segment considers themselves “spiritual but not religious?” There has always been quite an independent stripe among American believers and I believe Protestantism has some effect in that. When everybody becomes their own interpreter than pretty soon you can cut out the Church as the middle man. Protestant ecclesiology also kinds of lends to this with the fracturing from first national churches, to regional churches, to neighborhood “non-denominational” churches. A soft deism can develop where you might recognize the existence of God, but you live a life where this has no practical effect. Though that schism between belief and action is certainly well known among believers. The fracturing of Christendom into so many fragments also provides a barrier to belief. Jesus’ High Priestly prayer to the Father “that they may all be one” is one we must continue to constantly pray. After having read Ross Douthat’s excellent Bad Religion it is also well worth noting that it is not like from the beginning the US was totally religiously affiliated with a slow drain off towards secularism. While church attendance rates have certainly dropped in the last century there have been a certain ebb and flow. Instead of a call to holiness there seems to have been a dropped-call. A call I know I should answer, but when I see the Caller ID of Holiness, I would rather not pick up since talking about holiness is much easier than living it. I’ve heard a saying that goes “God is great…all the time”. Regrettably, many really mean “God is great…as long as He agrees with me”. 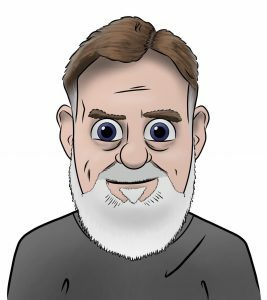 You may wish to becareful with the Pew Study, Mr. Archbold quoted American Thinker that they played around with the definitions and technicalities, playing believers in God within the mix of the ‘nones’. Christopher, Jeff mentioned that 😉 At any rate, the graph shown at pew research is rather clear in showing that the atheists combined with the agnostics are just above the 5% mark, the atheist making up less than half of that number. Not just the Deistic sense, but actually strict Protestants who don’t adhere to any denomination, I guess as Mr. Miller stated.